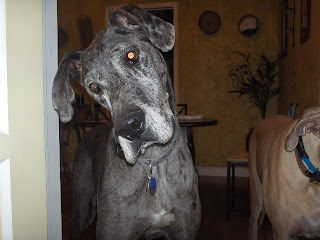 Sasha, the Great Dane Princess 2001-2012 Shared about her life living with mommy and daddy. Great Sites for Big Dogs! Turn up loud to hear with human ears! Mommy says Max did the same thing when he first heard our kitty, before she went over rainbow bridge. Don't ya love how they tilt their heads like that....SO cute! :) That picture of Max makes me sad and happy to see his cute face...what a darling boy he was. I can only imagine how much you miss him. Rut Roh... kitty furs will totally gum up the works in a 'puter... hope you could help her get it outta there! Very nice to see Max again. He was such a handsome boy and that is a very cute pic of him! I blasted my speakers and I don't hear anything?? Neither did the cats, and they also said to tell Sasha "Dawgz drule & catz rool!" MOL!